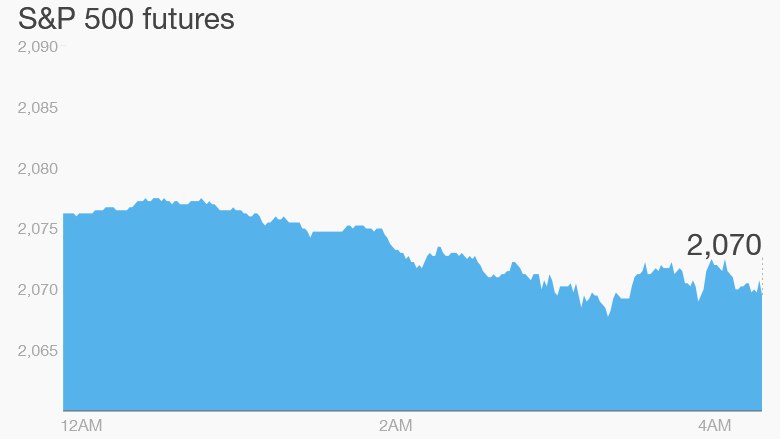 If you look at the markets this morning you may get a churning feeling in your stomach. It's red across the board. 1. Global stocks drop: The chair of the Federal Reserve, Janet Yellen, reportedly said Wednesday that valuations in the stock market were "quite high." Yellen was speaking at a public question-and-answer session in Washington. Investors responded by hitting the "sell button." Nearly all European markets are pushing lower in early trading, with many markets sinking by more than 1%. Asian markets ended with significant losses. All of the main indexes in China are off by 1% to 3%. Meanwhile, U.S. stock futures are in the red, but the move is relatively small. On Wednesday, the Dow Jones industrial average lost 86 points, the S&P 500 dipped 0.5% and the Nasdaq slid 0.4%. 2. Stock market movers -- Keurig, Whole Foods, Tesla: Shares in Keurig Green Mountain (GMCR) were declining by about 12% in extended trading after the company reported that sales of its brewing machines and accessories tumbled 23% in the first quarter, compared to the year before. Shares in Whole Foods (WFM) are also off by 12% premarket after the high-end grocery chain reported quarterly results that missed market expectations. On the flip side, Tesla (TSLA) stock is edging higher after the firm reported a smaller-than-expected loss in the first quarter. CEO Elon Musk also said Wednesday he's seeing strong orders for the company's new home batteries. 3. Earnings and economics: A number of large companies are reporting earnings this morning. Alibaba (BABA), SeaWorld Entertainment (SEAS), Kate Spade (KATE)and Molson Coors (TAP) are among the firms reporting ahead of the open. CBS (CBS) and Crocs (CROX) will report after the close. On the economic side, the U.S. government will report weekly jobless claims at 8:30 a.m. ET. 4. Pound getting pummeled? : Brits are casting their votes today in the most closely fought election for a very long time. The pound is dropping versus all other major currencies. Market watchers say the currency could be hurt further if the result of the vote is inconclusive. "For the markets, it is the very fact that the result is so uncertain that investors are yet to make their mind up as to how to position themselves," said Angus Campbell, a senior analyst at FxPro. "As ... the picture becomes clearer there's plenty of potential for volatility to pick up."